Photos and podcast: Nearly 300 years on, why does The Beggar’s Opera still resonate? 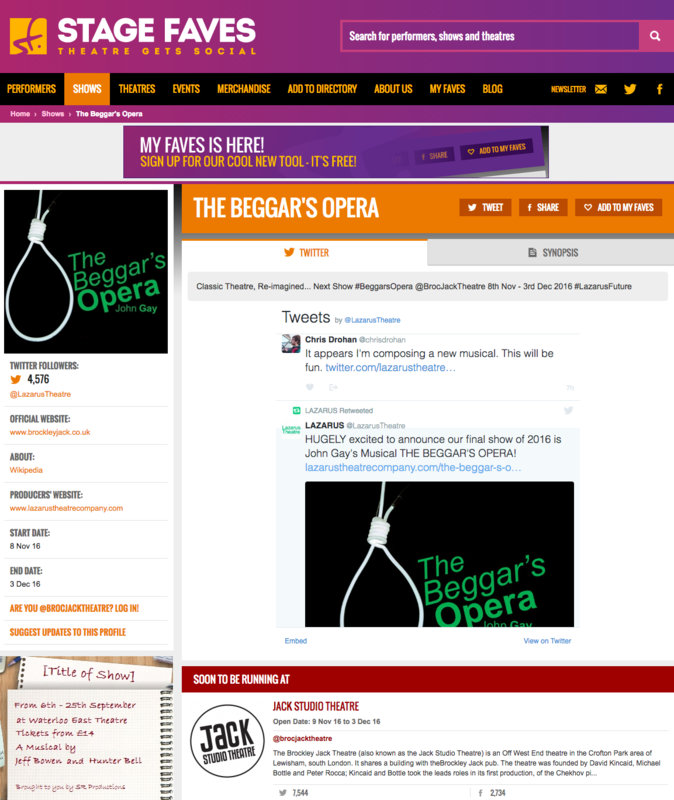 There’s something in the water with The Beggar’s Opera at the moment. Lazarus Theatre’s new, modern-dress, 80-minute version at Brockley Jack Studio Theatre is the third major London presentation of the story of womanising highwayman Macheath this year. Dougal Irvine’s musical The Buskers Opera, set in post-Olympics London with a Boris Johnson-like mayor (premiered on the day of the mayoral election), came first in May, followed by, at the National, Simon Stephens’ new version of The Threepenny Opera, which was originally written by Bertolt Brecht to mark the 200th anniversary of The Beggar’s Opera in 1928. Lazarus artistic director Ricky Dukes has returned to John Gay’s 1728 original satire but given it lots of new twists (spoiler alert: you’ll never have seen it end in such an electrifying manner before) as well as new lyrics and music by Bobby Locke and Chris Drohan. So what is it about this tale of corruption and capturing the populist mood of the people on the street that so resonates – today and through the ages. And how is the piece itself so, seemingly, infinitely adaptable? 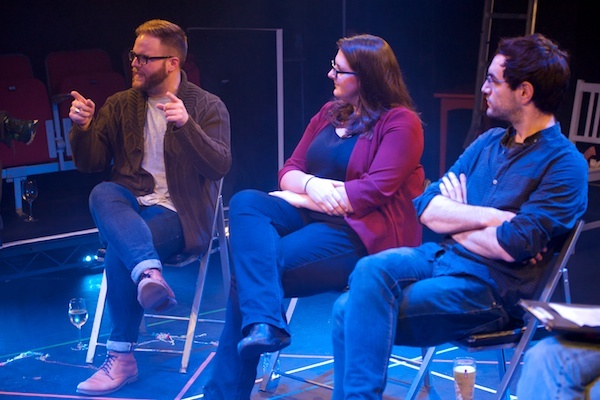 For last night’s post-show Q&A, we discussed these and other issues with a panel include actor-producer Michael Peavoy, who worked with Dougal Irvine for four years on The Buskers Opera, and Lazarus Theatre dramaturg Sara Reimers and Ricky Dukes. As a fascinating addition to The Beggar’s Opera run, on 21 November, Sara will direct the company in a rehearsed reading of Gay’s sequel to the piece Polly, taking up the story of Macheath’s erstwhile wife. Written in 1729 it was banned for 50 years by the then Prime Minister Robert Walpole following the controversy and success that surrounded The Beggar’s Opera. Listen to the unedited podcast below for more on that too. Q&A photos by Peter Jones. The Beggar’s Opera continues at London’s Brockley Jack Studio Theatre until 3 December 2016.